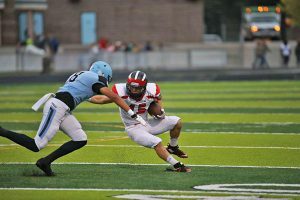 The Cedar Springs varsity Red Hawks took on the Huskies of Forest Hills Northern on Friday, October 6, at a conference away game at FHN’s stadium. The Hawks have a current overall standing of 5-2, with both of their losses and one of their wins outside of the OK White conference. The face off between the Hawks and Huskies resulted in a final score of Cedar Springs 44, Forest Hills Northern, 21. The first touchdown of the night was scored by junior Ryan Ringler, followed by a completed two-point conversion, making the score 8-0, with 6:46 left to play in the first quarter. The Huskies came back quickly, with Xavier Webster making a pass left to teammate Ian Rampersad, who then lateraled to Brandon Matthews for a 33-yard run into the end zone. Red Hawk varsity player Lucas Pienton scored the Hawk’s second touchdown of the night with 1:05 left in the quarter. The Hawks ended the first quarter with a completed two-point conversion after a pass made by quarterback Nicholas Campione to senior Parker Amell. Throughout the game, the Hawks held off the Huskies, who made no point advances in the second or third quarters. Senior running-back John Jacob Todd began the second quarter with a 59-yard touchdown. Campione assisted his team with a run into the end zone for a two-point conversion after Todd’s previous run. Todd went on to score another touchdown just before the end of the second quarter, with 59 seconds left to play in the first half. Additional points throughout the night were scored by Cedar Springs senior halfback Darius Barnett and quarterback Campione. The Huskies scored the final touchdowns of the night, with runs by Ryan Balkema and Mack Boyer, and PATs (points after touchdowns) kicked by Carter Clark. In their quest to win the OK White, the varsity Red Hawks will battle first place Forest Hills Central (5-0 conference, 7-0 overall), on Friday, October 13 at Red Hawk Stadium. It’s also senior night. According to Athletic Director John Norton, they will introduce senior football players and cheerleaders PRIOR to the game on Friday. They ask that all parents of seniors meet at the flagpole no later than 6:30 p.m. on Friday. They will then do introductions at 6:40PM. Kickoff is at 7 p.m. Come out and cheer on your Red Hawks!